There just are not enough hotels in the world that really make you feel like family. We love the feel of coming home and seeing the extended family but let’s be honest, Christmas comes but once a year. 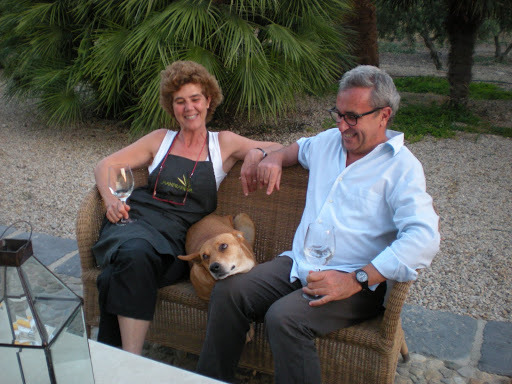 Lucky us for finding a beautiful olive oil farm in southern Sicily with Sylvia and Gisueppe, the two owners who feel like your loving aunt and uncle welcoming you back home. 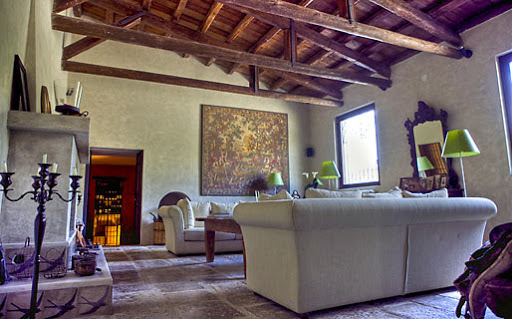 Azienda Agricola Mandranova is a stunning olive oil farm complete with spacious rooms luxuriously designed by someone who knows how to bring a little heart into modern design. The property stretches over many acres and includes 10 doubles, 5 suites, and two self-catering villas if you choose. 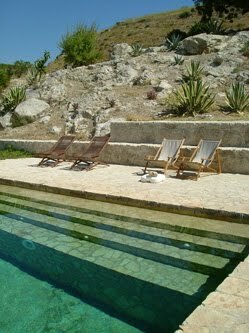 One villa comes with its own sulfur infinity pool overlooking the olive trees. The farm also has a regular medium sized pool that also overlooks the property. There is no TV or phones in the rooms but Giuseppe is more than happy to play a billiards game or watch a movie with you in the main living room. You really can’t get any better than the Sicilian hospitality here at Mandranova. An added bonus – Sylvia offers cooking classes in which you learn three main things: don’t cut corners, don’t waste anything, and the end product will be worth the time and effort. Quite a good motto for life too, we must say. Dinnertime at Mandranova is the real highlight. 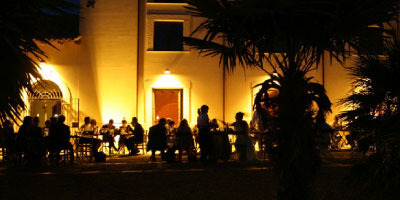 Guests gather around the small lush “piazza” area around 7:30, mingling and enjoying a glass of prosecco or wine. Syliva then asks guests to sit at small tables outside all close enough to feel as though you are dining with your extended family. Giuseppe weaves in and out of the tables offering a wonderful Sicilian wine collection, all priced at cost. He then also brings their prize winning olive oil around the tables, proclaiming various things are “beauty-vool!” Then comes the food. The food, the food, the food. At first you think Gisueppe is the charmer but now you learn that Sylvia is the real soul of the operation – offering four courses which include appetizer, primi, secondi, and dessert. She serves what can only be described as gorgeous food, and comes around and encourages seconds of every course (just like mom!). Highlights from our stay included a perfectly al dente sicilian penne norma (tubes with eggplant and ricotta with chili peppers), spiced mustard pork loin, and a to-die-for chocolate cake with the leftover chili baked in with a perfect touch of surprise heat. 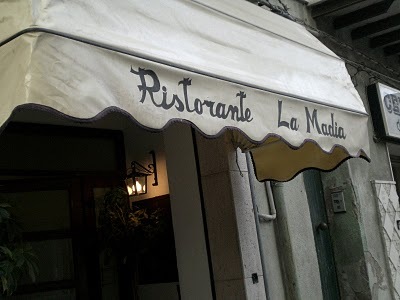 If you are here for a longer stay (we don’t recommend venturing out for dinner unless you are here for longer than three days) and are craving a fine dining experience, we would suggest you try La Madia, a 20 minu te drive from Mandranova to the small town of Licata. This area is not known for many restaurants, so they are lucky to have such a great restaurant in the neighborhood. The decor is not much to speak of and it may be a bit cheesy to some, but the food is delicious and worthy of its two Michelin stars. The chef is mostly self taught which is rare for this caliber of a restaurant and is more than happy to stop by and chat with you (er, in Italian) about your dining experience. 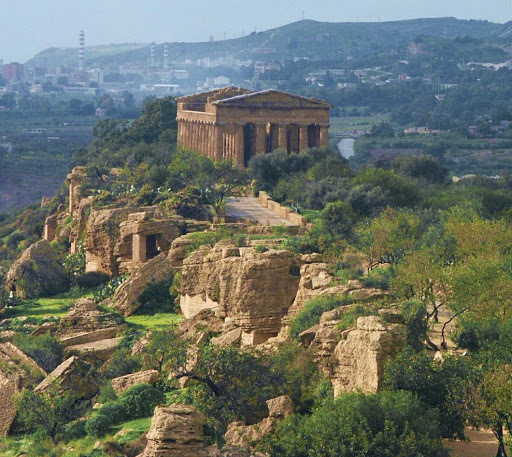 Agrigento is a perfect stop for all of the history buffs out there with the beautiful Valley o f the Temples. Some say that in Sicily you find better preserved Greek temples than exist in Greece itself. Originally called Akragas, the Valley of Temples was founded as a Greek colony in the late 6th century BC. You can take a tour on site which will take you through this amazing archaeological park and learn the story of the rise and fall of one of Sicily’s most important ancient cities. The beaches here are not the most beautiful beaches in the world but they are still fun and filled with Italian families vacationing here in the summer. Our favorite stop was Lido Miramare near the Baia D’Oro Hotel. The best part of this small beach is the delicious fresh fish and white wine served up at lunchtime. They also have fresh bruschetta and spaghetti all served up with the divine Mandranova olive oil..
Modica is a bit further away at about an hours drive but this is where the first chocolate was ever made. Needless to say, it has been perfected here from ancient recipes at the world’s first chocolate factory. Worth a trip if you can tear yourself away from the beach. In addition to the cooking class offered by Silvia, Giuseppe takes guests out dolphin spotting – or swimming in the warm season – with a tasty lunch on a small island ending with a trip to the fish market in Port Licati. He can also take you on a tour of the olive oil grounds, regaling you with stories of his family’s land, olive oil production, and even the Mafia. Plenty of things to do here but we preferred to lay by the fresh water pool, overlooking the beautiful grounds, drinking a glass of olive oil. Olive oil, you balk? Don’t judge us until you’ve tried the stuff. A beautiful and charming home in a peaceful place in enclosed garden of olives plants, two wonderful and generous hosts.